Home to beach resorts, electronics and garment factories, Batam and Bintan are poised to become a hub producing halal food and products, as Indonesia moves to tap a multi-trillion-dollar global market. The islands are among four pilot locations identified by the Indonesian government to develop a "halal park", a designated industrial zone to process food, beverages, cosmetics and pharmaceuticals that comply with Islamic standards so Muslims can consume them. Halal is Arabic for "permissible". The other two parks are in Pulo Gadung in Jakarta, and Serang in Banten province. All the parks will be sited in industrial estates, said Mr Ignatius Warsito, deputy director-general of industrial region development at the Ministry of Industry. They will provide centralised services for businesses to apply for halal certification and share facilities such as cold rooms so as to create effective and efficient supply chains, he told The Straits Times. Park operators are at "various stages of approval" with the ministry and the authorities, a process he hopes will be completed as early as the end of the year. While Muslims make up around 90 per cent of Indonesia's 260-million population, it has no halal industrial parks. Malaysia, also a Muslim-majority nation, has around two dozen of such parks. The global halal food industry is estimated to be worth US$2.5 trillion (S$3.4 trillion). With the number of Muslims set to reach 2.2 billion by 2030, or more than a quarter of the world population, countries including Indonesia are eyeing a slice of the halal pie. Indonesia is the world's top consumer of halal food, and fifth in consuming halal medicines, cosmetics and Islamic clothing, President Joko Widodo said on Facebook in February. "With this huge market potential... Indonesia must be the main driver of the Islamic economy. We should not be the target market of other countries, we should not be mere consumers." Islamic scholar Ma'ruf Amin, his running mate in next April's presidential election, elaborated on Mr Joko's vision: "If Pak Jokowi is re-elected, he wants to make Indonesia the world's largest producer of halal products in the future." A neatly trimmed grass field lies vacant among manufacturing factories in Batamindo Industrial Park in Batam. 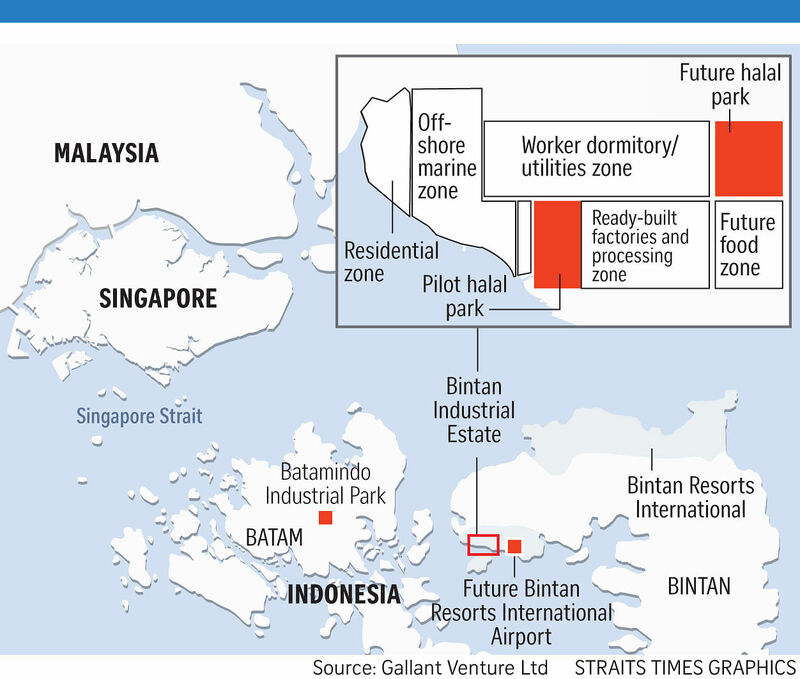 Over in adjacent Bintan, dozens of ready-built beige factories sit by the sea in Bintan Industrial Estate. Singapore-based investment holding company Gallant Venture, which owns the Batamindo and Bintan estates, is gearing up to get the halal parks on the islands up and running. About 10 companies, half of which are Singapore-based, have expressed interest in setting up operations in Bintan. These businesses vary from seafood and agrotech farms to cosmetics firms, said Mr Edmund Lai, Gallant's head of Riau investment marketing. Each park will be developed in phases and will be at least 10ha, about half the size of Jurong Bird Park. A project of such a scale typically costs around $40 million, he said. The Bintan park will focus on food and beverage products, while the Batam park will specialise in non-food products such as cosmetics and items such as shampoo, he added. Halal food items have to be prepared under strict Muslim dietary laws which mandate, for example, that an animal be slaughtered by a cut to the jugular vein. Halal non-food products must not contain forbidden ingredients such as pork, blood or alcohol. "We want to develop a dedicated food and halal processing zone in the estates to allow manufacturers to produce safe, halal-compliant products through our integrated facilities," said Mr Lai, adding that these include treated water, ready-built factories and a laboratory. "We want local and global consumers and distributors to confidently buy the products, knowing that they are made in our processing zone." Gallant Venture started lobbying the Indonesian government to develop the halal parks around two years ago, as part of its plan to "reposition" its industrial estates after slowing growth in manufacturing sectors such as textiles. At the same time, calls were growing for a common halal marketplace and ecosystem in Indonesia for the local and export markets. "We have been thinking about what is the next trend for our industrial parks. Investors want us to carve out a halal zone where they can have accessibility to all the infrastructure and a one-stop service to kick-start their products," Mr Lai said. Launching the halal pilot project in Batam and Bintan is the latest effort by the Indonesian government to revive the sluggish economy in the decade-old free trade zone. The islands, together with a third island Karimun, form what is collectively known as the BBK free trade zone. In March, the Nongsa Digital Park opened in Batam. Plans are also under way to build a 7km bridge connecting the two islands. "Batam and Bintan, being strategically close to Singapore, Malaysia and global trade routes, are expected to attract investors," Mr Warsito said. Gallant Venture is also building an international airport in Bintan, which when ready by the end of 2020, will be able to handle up to 1.5 million passengers a year. Currently, tourists fly to Singapore and take a ferry to the island's northern resort area. Mr Eugene Park, Gallant's chief executive, said tourists can save around two hours if they fly directly to Bintan. Furthermore, they need not apply for multiple-entry visas into Singapore. Mr O.K. Simatupang, deputy head at the Indonesian Chamber of Commerce and Industry which oversees free trade area development, said the development of halal parks in Indonesia is long overdue. "While halal has Islamic origins, the world has now embraced it as part of a lifestyle. People from England and Abu Dhabi are all looking for halal products now. We are ready to take off," he said. Mr Simatupang hopes Malaysia, Singapore and Indonesia can combine their strengths to capture the world market for halal products. "Leave the product manufacturing to Malaysia and Indonesia. Singapore can be the trader," he said. Singapore businesses, too, have been exploring the potential of the halal food market in the region, said Singapore Chinese Chamber of Commerce and Industry president Roland Ng. In April last year, it led a business delegation to Bintan. "Despite concerns about manpower and regulation costs, the regional halal market provides a great platform for Singapore companies to grow and expand their global footprint," he said. Mr Ronnie Faizal Tan, vice-president of Hao Halal Hub, a wholly owned retail subsidiary of Singapore supermarket chain Hao Mart, said he is considering Bintan as a location for future operations in processing halal frozen or packaging ready-to-eat food for the Indonesia and Singapore markets. He said: "Labour costs are lower, raw materials are easily accessible, and Singapore and Indonesia have good relations."